Good morning. This is Ian Hoyer with the Gallatin National Forest Avalanche Forecast issued on Tuesday, January 15th at 7:15 a.m. Today’s forecast is sponsored by Yellowstone Arctic Yamaha and The Friends of the Avalanche Center. This forecast does not apply to operating ski areas. An inversion continues this morning with cooler temperatures (teens F) in the valleys and warmer temps (high 20s F) at ridgetops. Winds were light yesterday and there has been no new snow. Winds will remain light today and be generally southerly. Temperatures will rise into the high 20s and low 30s F. Snowfall will begin this afternoon in the southern mountains, with 1-2” of new snow by tomorrow morning. The next chance for snow in the northern mountains is Wednesday night. With a widespread poor snow structure, it remains possible to trigger a large avalanche. The base of the snowpack consists of 1.5’ of weak snow, capped by a 1-3’ thick slab of more cohesive snow (photo). The southern mountains received a foot of heavy snow followed by strong winds at the beginning of last week. As we get further out from that loading event, signs of instability are becoming less frequent, but have not gone away. Yesterday, we got a report of a natural avalanche near Reynolds Pass, just outside of our advisory area (photo). 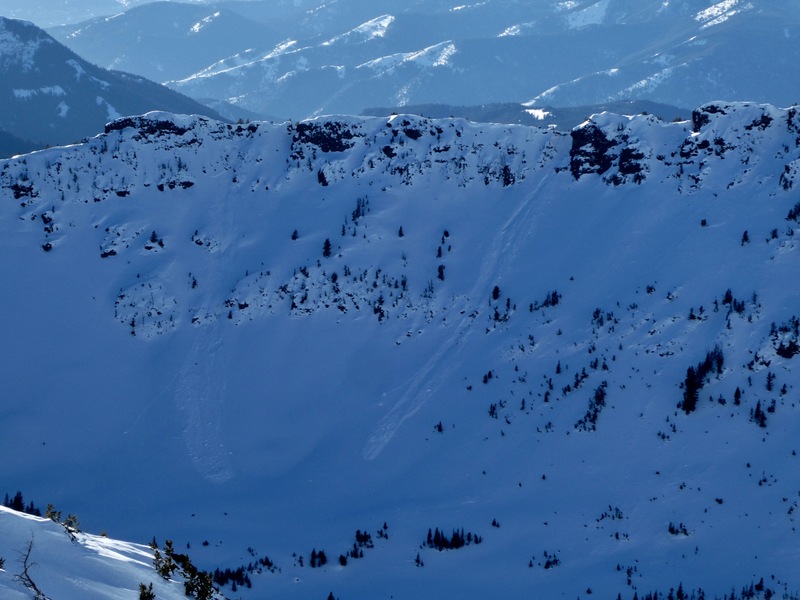 On Sunday, skiers in the southern Madison Range skiers got significant collapsing on a similar snowpack and saw a recent avalanche (details and photo). The large natural and human triggered avalanches that broke during and immediately after last week’s storm provide good examples of the sort of slides you could trigger today (video, details, details). Each day without snowfall, the snowpack is slowly becoming more stable, but this is a slow process. Triggering an avalanche remains possible, and the avalanche danger is MODERATE. Snow flurries this afternoon won’t impact the avalanche danger. It’s been two weeks since the last significant snowfall in the northern ranges (chart of January’s snowfall). Without a new load, stability has slowly improved and triggering an avalanche has become unlikely. This doesn’t mean that you couldn’t find a pocket of unstable snow out there somewhere, just that those areas are becoming fewer and farther between. The structure to look out for is a cohesive slab (1-2’ thick) over weak layers that formed in early December. 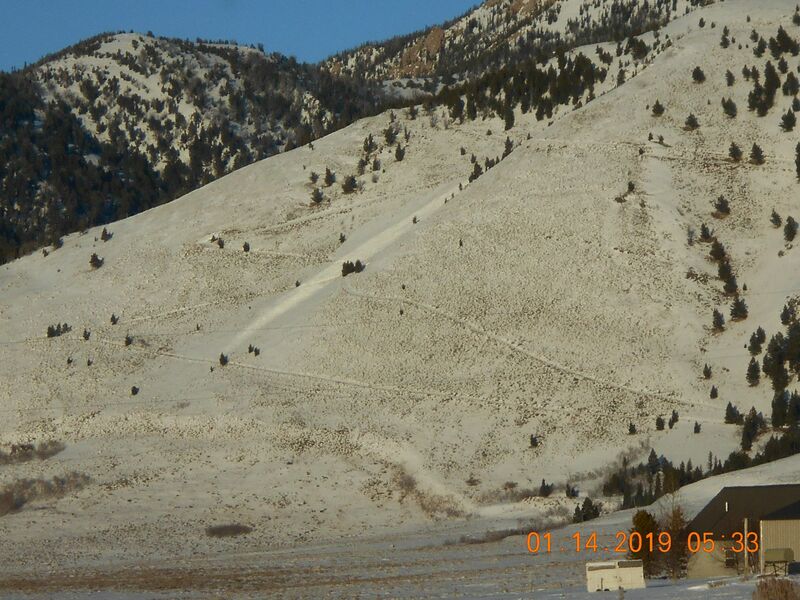 Alex and I found this structure on Sunday near Buck Ridge (video) and Eric found it on Saturday just north of Big Sky (video). While it’s becoming unlikely you’ll find them, still be on the hunt for signs of instability (cracking, collapsing, recent avalanches, unstable test results) and be ready to change your plans accordingly if you do. Digging down to look for weak snow and testing the interface between these layers is always a good idea. The avalanche danger is LOW. January 16, 17 and 19 or 20, Intro to Avalanches w/ Field Day, Info and Register Here. January 23, 24 and 26, Advanced Avalanche Workshop w/ Field Day, Info and Register Here. January 26, 1-hr Avalanche Awareness for Snowmobilers, 7-8 p.m. Holiday Inn West Yellowstone. January 22, 1-hr Avalanche Awareness, 6:30-7:30 p.m. U.M. Western Library. January 22, 1-hr Avalanche Awareness, 6-7 p.m. The Base Camp, Billings. Ian Hoyer just joined the GNFAC as a forecaster. We interview Ian in Dashboard Talks: Episode 1. From facebook: "natural avalanche down near reynolds pass.